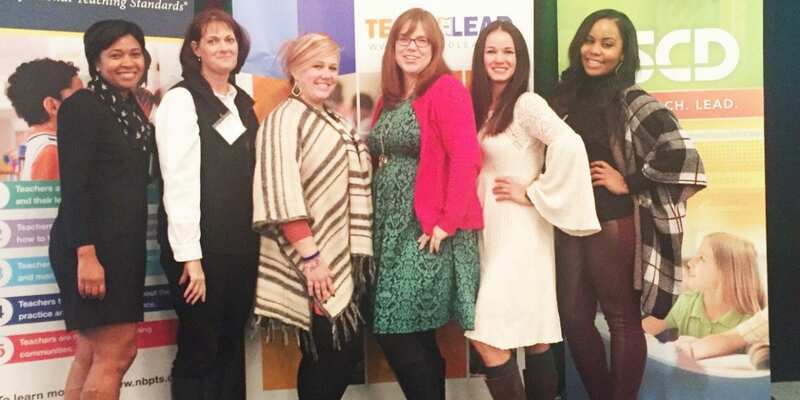 Hernandez Middle School educators, Desiree Le, Wendy Tucker, Laura Terry and Akea Powell were among an elite group of educators chosen to attend the Teach to Lead Summit held in Chicago in December. There were 25 teams chosen nationally to attend the Summit based on an application and action plan for an innovative program to be implemented on the campus.The team also included Laurie Garza from United Way who has been a valued partner with Hernandez this year. The Teach to Learn Summit is hosted by the United States Department of Education (USDE), the National Board for Professional Teaching Standards (NBPTS) and Association for Supervision and Curriculum Development (ASCD) with the goal of catalyzing fundamental changes in the culture of schools and the culture of teaching. This will allow teachers to play a more central role in transforming teaching and learning and developing policies that affect their work.The Summit is intended to help focus on and advance the groundbreaking, teacher-led work that is happening in states, districts, and schools across the country. After a panel discussion with U.S. Secretary of Education, Arne Duncan, teams met with facilitators to develop a logic model from their action plan. The team from Hernandez worked on a plan to transform Hernandez to a community school that provides students authentic opportunities to explore career possibilities and build capacity through innovative teaching and learning experiences, and increased student engagement. The project, ‘Go Local with Community Engagement,’ would make Hernandez a community school where partners work together to expose students to careers, opportunities and advanced programs they might otherwise not have the chance to experience. Because Hernandez is an International Baccalaureate (IB) campus, they have already made many connections with the business partners during the course of their IB projects. Becoming a community school is a natural progression for the campus. Hernandez educators have mapped out a two-year implementation plan. Immediate goals include having local business partners volunteer and provide opportunities during classroom instruction and to make intentional connections between students and community partners through the Out in the Community Day on April 5, 2017.